Cover: Those in the air, left to right , are Obsidian; Green Lantern (GL) Kilowog; Skyman; Aqualad; Black Canary; Wonder Woman; Aquaman; Batman; and Green Arrow. On the ground are the Grandmaster; Blue Beetle; Jade; GL Guy Gardner; and Flash. Tucked away at the bottom, beneath a Manhunters leg, is Mr Bones. Page 1: Dr Fate in the middle of the group, facing away from us. Using Fate as a divider, to the left of the page, top to bottom, are Firestorm; GL Katma Tui; Superman; and Martian Manhunter. To the right, again top to bottom, are Captain Atom; Hawkgirl; Hawkman; GL Arisia; GL Hal Jordan; Harbinger; and GL Driq. We last saw these heroes in the previous issue fighting the Highmaster; Dr Fate had accidentally sent all of them to a hellish dimension and they elected Superman and Hal Jordan to host their souls (including that of Fate himself) while Superman and Jordan found and defeated the Highmaster in yet another dimension. That fight took place in SUPERMAN #14 (shown in Crossovers Week 6) but there was no mention of returning for the stranded heroes, nor how they got out of that place. It’s as though that whole “trapped in another dimension” sub-plot was pointless . . . Page 2 – Panel 1: Fate explains that he is not the original and cannot contact his mentor, just as we saw in the previous issue. Page 2 – Panel 2: Katma’s reaction to being stranded in space was a lot more vocal on the previous page. Page 2 – Panel 5: Arisia, always looking on the bright side! Page 3 – Panels 4 and 5: Harbinger pops off. 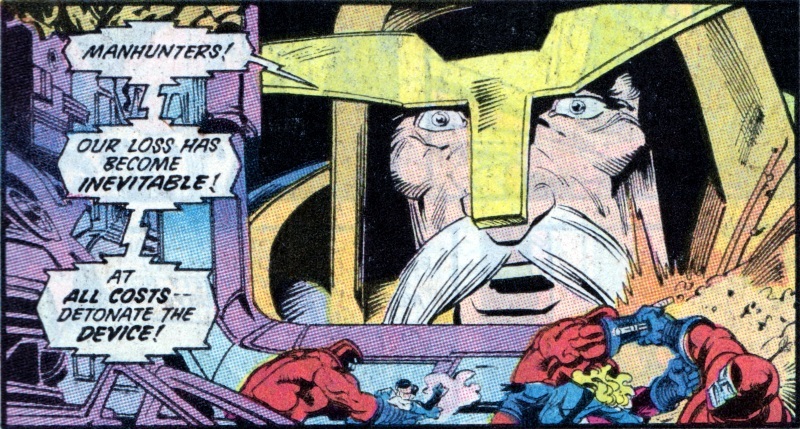 Page 2 – Panel 6: Captain Atom isn’t worried as he thinks the war against the Manhunters is over, following the destruction of Orinda as shown in FIRESTORM #68 and JUSTICE LEAGUE INTERNATIONAL #10, both in Crossovers Week 5. Page 3 – Panel 1: Harbinger was raised by the Monitor on his satellite, as shown in CRISIS ON INFINITE EARTHS. Page 3 – Panel 2: Martian Manhunter helpfully explains what Harbinger’s talking about – she has formed some sort of link with Earth itself. 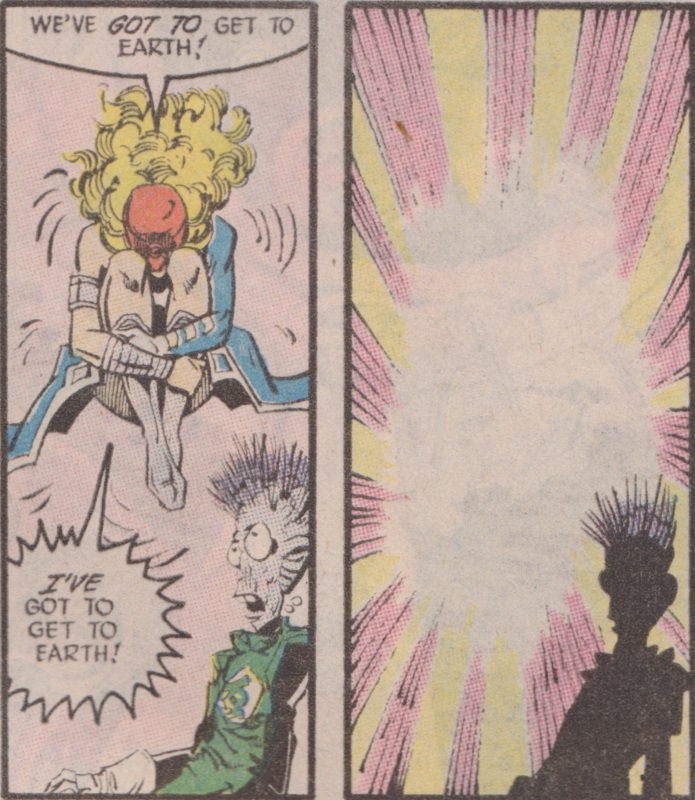 Page 3 – Panels 3 to 5: As GL Driq looks on, Harbinger somehow manages to work herself up in to such a state that she disappears, presumably to appear on Earth. Page 3 – Panel 7: Harbinger’s new-found power is explained away by Dr Fate as clearly being part of the Millennium event. Page 3 – Panel 8: With no other option, Superman rallies the troops and they begin the (potentially) eleven year long journey back to Earth. Page 4: This is the Sunspore craft that is hoped to take the heroes to the centre of the Earth and which was taken from Kord Industries in BLUE BEETLE #21 as shown in Crossovers Week 6. At the controls on the left is Blue Beetle with Mr Miracle beside him. Page 5 – Panel 1: Left to right are Wonder Woman; Flash; Batman; Mr Bones; Blue Beetle; Green Arrow; GL Guy Gardner; Mr Miracle; and Brainwave. 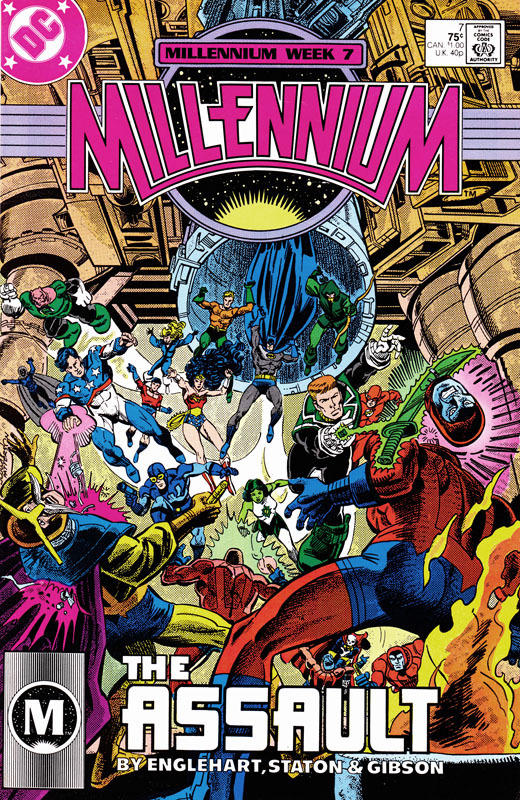 Green Arrow’s presence in the crossover is interesting – the cover date for MILLENNIUM is February 1988, the same as the first issue of his series that was written by Mike Grell which was one of the early series to be labelled as “Suggested for Mature Readers,” the precursor to the Vertigo imprint. This would be the last of the major crossovers to feature Green Arrow for some time. Page 5 – Panel 2: This is Aqualad. Page 5 – Panel 3: And this is Aquaman. Page 5 – Panel 4: We’ve seen some of these folks in Panel 1 but left to right are Mr Bones; Wildcat; Flash; Nuklon; Batman; Black Canary; Green Arrow; GL John Stewart; Hourman; Obsidian; Jade; Skyman; with GL Kilowog in the bottom right foreground; and Aqualad in the top right background. Page 6 – Panel 2: Gardner attempts to make a joke of things . . . Page 6 – Panel 3: . . . and while it’s not a brilliant joke, Wonder Woman’s description of him as “brain-damaged” seems a little harsh. Page 7 – Panel 4: Kilowog’s impressed. Page 6 – Panels 5 and 6: The Sunspore enters the volcanic rift at the bottom of the trench . . . Page 7 – Panel 2: . . . and slips through a force-field, crashing to the ground below. 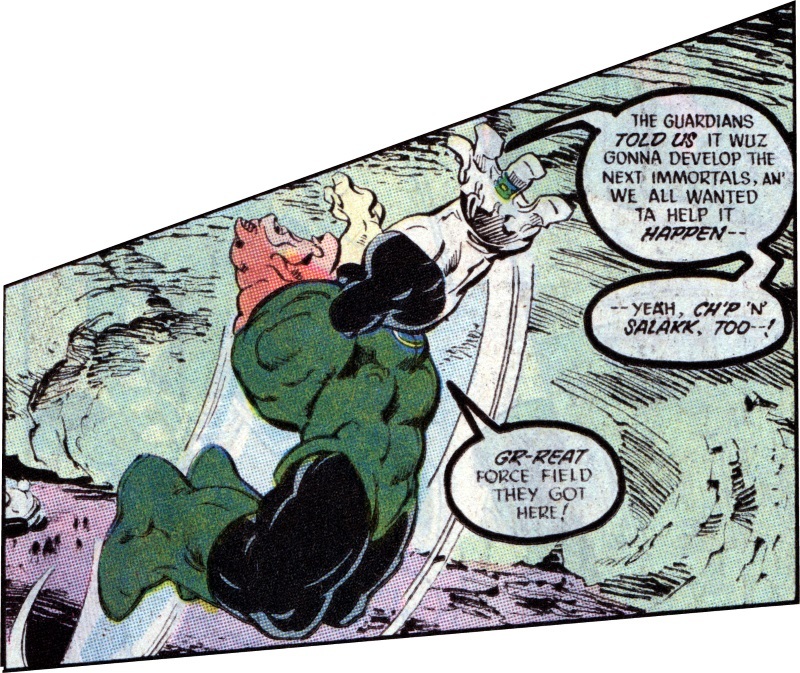 Page 7 – Panel 4: Kilowog flies up to the force-field and is impressed by it. He also mentions Ch’p and Salakk, two other Green Lanterns who had remained on Earth following the departure of the Guardians and Zamarons, but who had travelled to and stayed in the future several (real time) months before this story. Page 7 – Panel 5: And Flash has found the way in. Page 8 – Panel 1: And Mr Miracle finds the latch which is rendered moot . . . Page 8 – Panel 2: . . . as Nuklon simply rips the door out of the ground. Page 8 – Panel 3: I love how Mr Miracle is so precise just by looking down the hole! Page 8 – Panel 5: The heroes are interrupted by the arrival of Harbinger who has managed to teleport herself across eleven light years. Page 8 – Panel 6: “The Monitor … was my father … and my mother … was this world!” Good grief, that’s atrocious dialogue. Page 9 – Panel 1: And now she’s talking in the third person, tying herself in to the evolution of the Earth and the Millennium event. Page 9 – Panel 2: The Lanterns and Jade form energy bubbles to carry the other heroes down, while Flash simply runs down the side of the hole. Page 9 – Panel 8: They don’t look well, do they? Page 9 – Panel 3: Back at the Green Lantern Citadel with the Chosen. 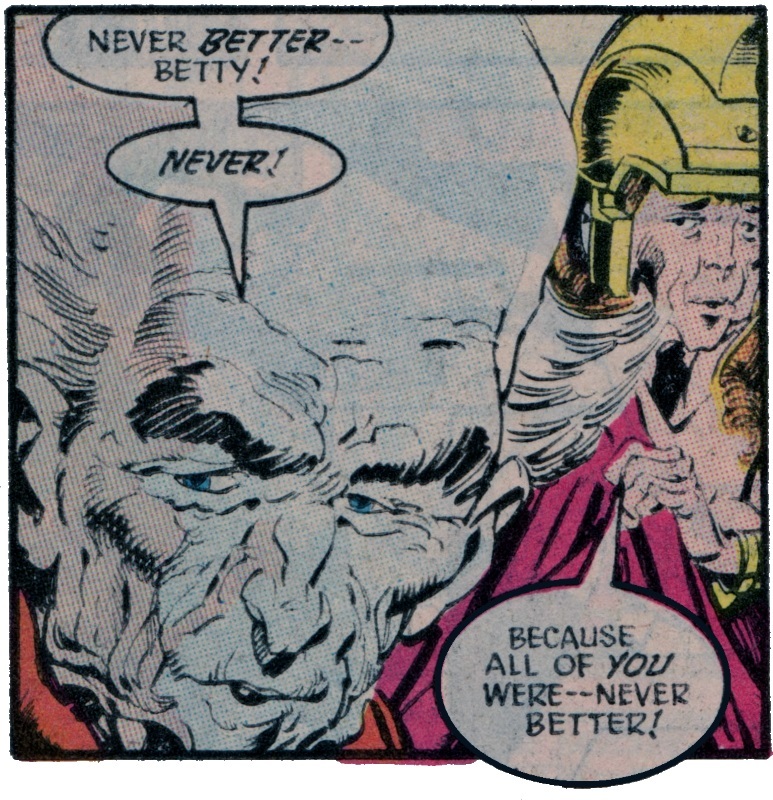 Left to right are Takeo Yakata; Celia Windward; Xiang Po; Tom Kalmaku; Floronic Man; Betty Clawman; and Gregorio de la Vega. At first glance, they appear to be dancing but . . . Page 9 – Panel 4: . . . Celia reveals they are performing Tai Chi. Page 9 – Panel 7: Herupa Hando Hu and Nadia Safir, both of whom are looking a lot older than when the series started. Page 9 – Panel 9: The Chosen looked shocked at the state of the Guardian and the Zamoran. Page 10 – Panel 1: Tom either sounds like a man ready for enlightenment . . . or a man craving a fix. Page 10 – Panel 2: This is Tegra Kalmaku, Tom’s wife, who really isn’t happy with Tom being one of the Chosen. Page 10 – Panels 4 to 7: Tegra seems to have a point here – Tom is completely focused on his work with the Chosen and seems to be ignoring both Tegra and their children. Page 10 – Panel 8: And we’re back with the heroes beneath the Earth as they infiltrate the Manhunter base. Even though we’ve met them already this issue, left to right (on or near the ground) are Flash; Batman; GL John Stewart; Obsidian; Wildcat; Nuklon; Skyman; Jade; and GL Kilowog. Above them, just coming out of the tunnel, are GL Guy Gardner; the boots of Hourman; Black Canary’s legs; Green Arrow; and the boots of (probably) Mr Miracle. Page 11 – Panel 1: What better way to surreptitiously listen in to the plans of your enemy than a giant, glowing, green ear? 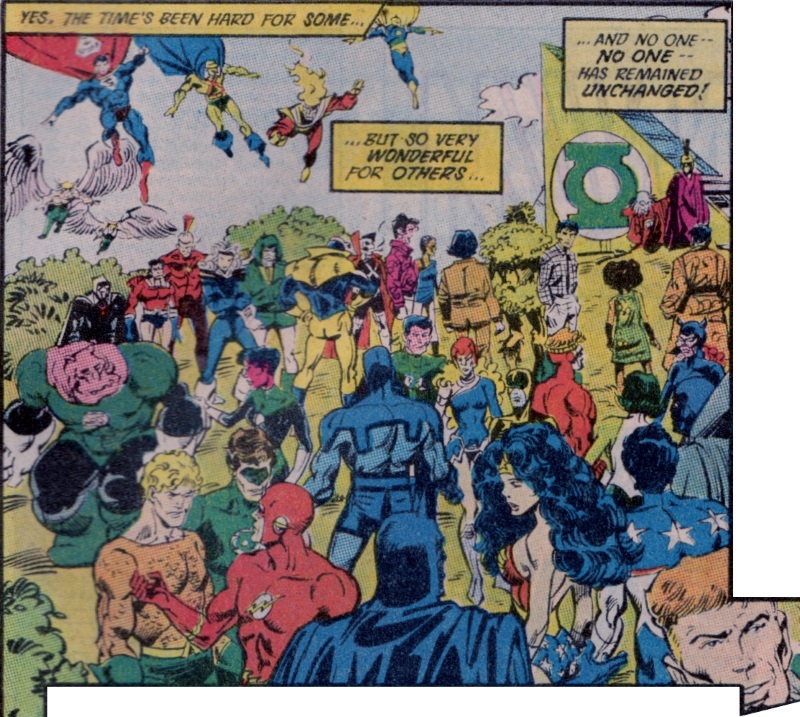 Page 11 – Panel 2: Among the mass of Manhunters on the left is Booster Gold; to the right is Pan; while the speaker is the Grandmaster. The Sonic Temple he mentions as being “gone” is the Manhunter base the heroes destroyed as shown in several issues in Crossover Week 4. The Highmaster was defeated in SUPERMAN #14 during Crossover Week 6. Page 11 – Panel 3: Oh no – the Manhunters have a device to destroy the world! Page 11 – Panel 4: And now the heroes know about their plan. Page 11 – Panel 6: Booster Gold volunteers to guard the device, while the Grandmaster mentions a saucer that could be used for escape. Page 12 – Panel 1: Mr Bones’ terrible poetry hints at the fact that he was once a villain in the group called helix who fought against Infinity Inc before he reformed and joined them. Page 12 – Panel 2: The Manhunters find the heroes spying on them and attack. Page 13 – Panels 1 and 2: Wonder Woman’s Manhunter is about to go down the pan. Page 12 – Panel 3: Blue Beetle makes his reappearance. Page 12 – Panel 4: As the floor collapses, the heroes tumble in to the Manhunter. To the left of Batman is Wonder Woman; to the right, grappling a Manhunter, is Aquaman. Page 13 – Panel 1: Wonder Woman faces off against Pan. Just behind her is Harbinger. 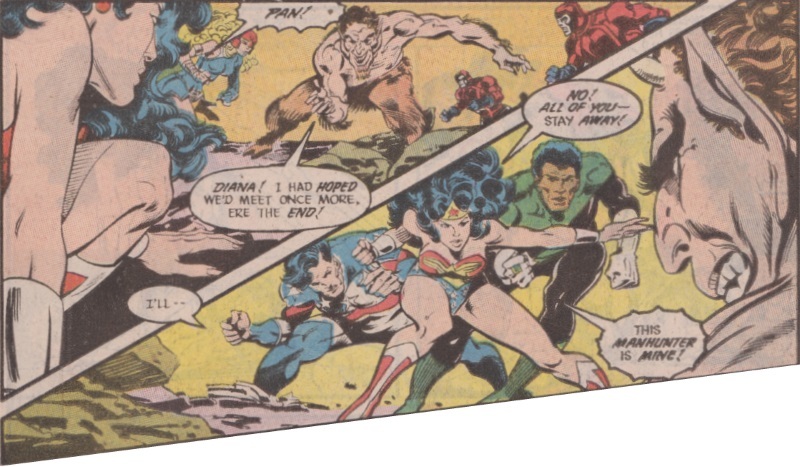 Page 13 – Panel 2: Wonder Woman blocks Skyman and GL John Stewart from attacking Pan, demanding he be left for her. Page 13 – Panel 3: Pan refers to Zeus’s orders; this is the Challenge of the Gods storyline running in Wonder Woman #10 to #13 and which the Millennium event was shoe-horned into. Page 14 – Panel 1: Wonder Woman refers to Zeus’s challenge; she also uses the word “cavil” which means an unnecessary objection. Page 14 – Panel 3: Pan insists that only someone willing to kill him can capture him. Page 14 – Panel 4: Wonder Woman captures him with her unbreakable lasso . . . Page 14 – Panel 5: . . . but Pan merely runs off, convinced she will let him go rather than kill him. Page 15 – Panels 1 to 4: Pan pulls against the lasso, Wonder Woman refuses to let go, and the inevitable happens with Pan being split in two. Page 15 – Panel 5: As Jade says, Pan was only an android. Page 15 – Panel 6: Flash attacks the Manhunters while thinking of his father who was revealed to be a Manhunter agent way back at the end of issue #1 and also in FLASH #8 in Crossovers Week 1. Page 16 – Panel 1: As mentioned above, around this time, Green Arrow was moving to a “Mature Audiences” title, which explains his slightly condescending thoughts here. Page 17 – Panel 4: Angry Kilowog. Page 16 – Panel 2: Mr Miracle says what we’re all thinking. Page 17 – Panel 1: The Green Lanterns did indeed replace the Manhunters . . . as well as the Hallas, but nobody seems to remember them any more. In the background is the saucer that the Grandmaster referred to as an escape vehicle. 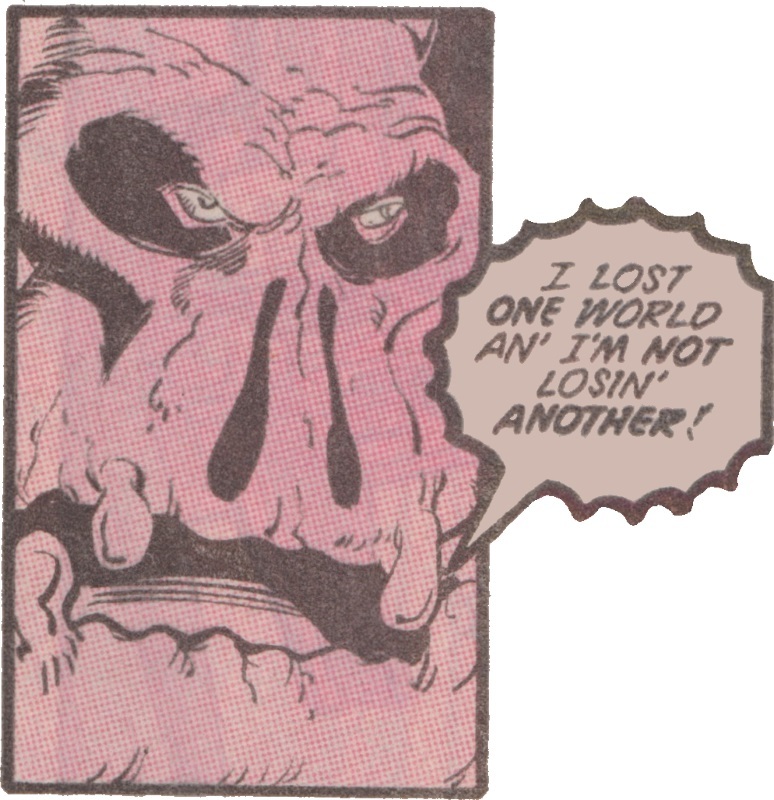 Page 17 – Panel 4: Kilowog refers to the destruction of his homeworld, Bolovax Vik. Page 17 – Panel 5: And Harbinger has to one-up him saying she lost “infinite earths“, a clear reference to CRISIS ON INFINITE EARTHS, even though, by this time, the Crisis had been retconned because there had never been a Multiverse so how could Harbinger have lost “infinite earths“? Page 17 – Panel 7: GL John Stewart destroys the saucers, preventing the Manhunters’ escape. Page 18 – Panel 1: And here’s the device the Grandmaster spoke of, that would destroy the Earth. Page 18 – Panel 2: Blue Beetle spots Booster Gold, while Green Arrow has a most random thought. Page 18 – Panel 5: Booster makes the traditional Justice League pun while attacking Green Arrow. Page 18 – Panel 6: The Manhunters prevent Obsidian from turning into his shadow form. Page 19 – Panel 1: Brainwave and Wildcat take on the Manhunters. Page 19 – Panel 3: Blue Beetle fires his light gun at Obsidian which allows him to cast a shadow. Obsidian mentions the Outsiders not being able to “take the heat“, a reference to the team disbanding in THE OUTSIDERS #28 as seen in Crossovers Week 5. Page 19 – Panel 4: Run away! Run away! Page 19 – Panel 4: The Grandmaster realises they have lost and orders the Manhunters to destroy the Earth. Page 19 – Panel 6: As the other Manhunter androids block the heroes, one of the robots heads to the device to detonate the bomb. Page 20 – Panel 1: But he’s stopped at the last second by . . . Page 20 – Panel 2: . . . Booster Gold who blasts the android, stopping the detonation. Page 20 – Panel 3: Booster appears to have flipped back to the side of the heroes and helps take the androids down. Page 20 – Panel 4: Reinforcements arrive with Mr Miracle and Jade in the air; left to right on the ground are Wonder Woman; Dr Midnight; Hourman; Batman; and Aquaman. This is Dr Midnight’s first appearance in this issues – she appears to have come out of nowhere. Page 21 – Panel 1: One Manhunter isn’t quite up to dying for the cause and makes to escape. Page 21 – Panel 3: And it’s the Harlequin. Page 21 – Panel 4: Booster celebrates the defeat of the Manhunters, a group he professed to belong to just minutes before. Page 21 – Panel 5: However, Blue Beetle, Green Arrow and Black Canary aren’t convinced. Page 21 – Panel 6: Booster claims to have infiltrated the Manhunters on purpose; in most cases like this, the readers are given a clue that the hero is still a good guy, but throughout the series and in BOOSTER GOLD #24 in Crossovers Week 3, Booster’s siding with the Manhunters has appeared genuine, motivated by his greed and desire to get his money back. Page 22 – Panel 1: The heroes stand amongst the remains of the Manhunters. Page 22 – Panel 2: And they’re joined by the heroes from space. Starting from Superman at the top and working clockwise are Hawkgirl; Hawkman; GL Driq; Martian Manhunter; GL Arisia; GL Hal Jordan; GL Katma Tui; Dr Fate; Firestorm; and Captain Atom. No mention is made of how they managed to get back but presumably Dr Fate was able to contact Kent Nelson/Nabu and transport them here. Page 22 – Panel 4: Herupa Hando Hu and Nadia Safir appear before them, asking them to return to the Citadel. Page 23 – Panel 1: One last big roll call for this issue. In the air are Hawkman; Hawkgirl; Superman; Martian Manhunter; Firestorm; and Dr Fate. Top row are Hourman; Aqualad; Nuklon; Black Canary; Green Arrow; Booster Gold; Mr Bones; Gregorio de la Vega; Celia Windward; Xiang Po; Floronic Man; Tom Kalmaku; Betty Clawman; Takeo Yakata; with Herupa Hando Hu and Nadia Safir in the top right. The next row is GL Kilowog; GL Katma Tui;Blue Beetle; GL John Stewart; Harbinger; Dr Midnight; Brainwave; Jade; Obsidian; and Wildcat. In the foreground are Aquaman; GL Hal Jordan; Flash; Batman; Wonder Woman; Skyman; and GL Guy Gardner. Page 23 – Panel 2: Herupa and Nadia give the Chosen one last task – to go back to the world and remember what they will be leaving behind. Page 23 – Panel 3: Celia Windward is off to investigate a suspicious looking car. Page 23 – Panel 4: While the Infinity Inc team offer to take Betty back to Australia, Booster Gold basically kidnaps Xiang Po and takes her off to see how terrible the world is.